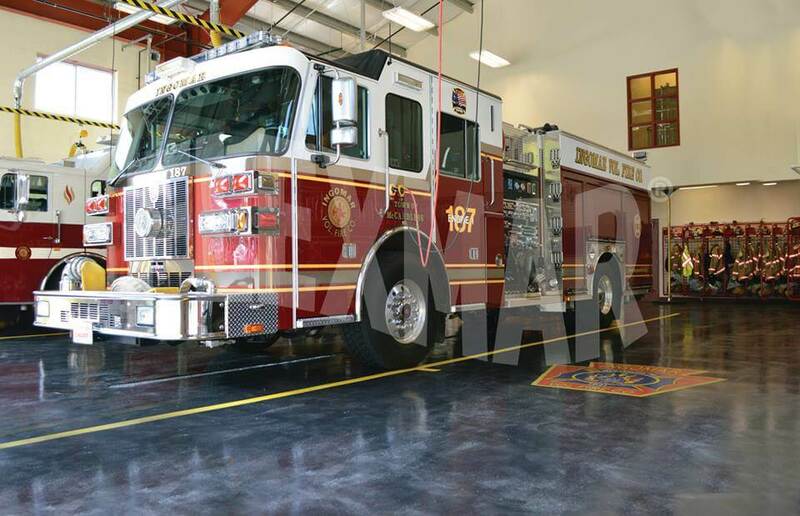 Floor Coatings Case Study: Ingomar Volunteer Fire Co. Firefighters value the practices of prevention and protection. It begins at the fire station, by sourcing high-quality, reliable, long-lasting protective equipment, tools, vehicles, and facilities—that are just as hard-working and dependable as they—to help them train, prepare, and respond. Such is the case at Ingomar Volunteer Fire Company, providing fire and rescue service to a suburban-Pittsburgh community of approximately 30,000 residents. 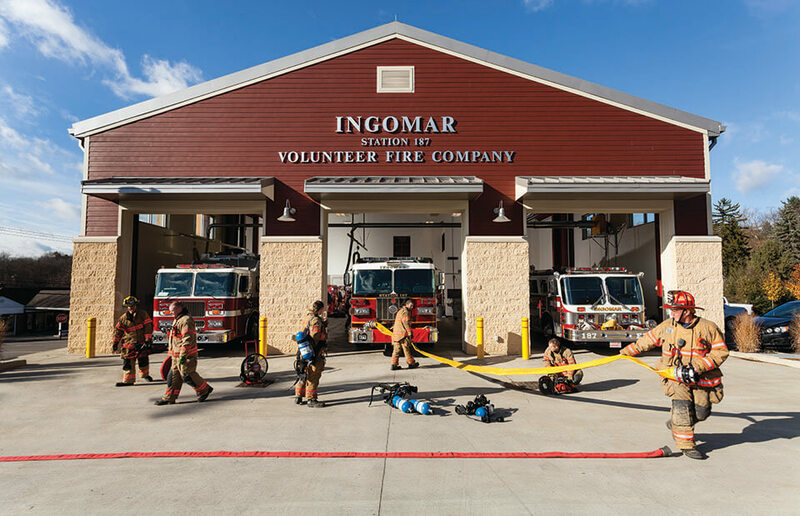 Ingomar operates two pumper engines, two rescue squads, and a ladder truck from two stations, responding to over 300 emergency calls for service every year. The fire company’s main station, built in 1954, was becoming a growingly inadequate facility. By the early 2000s, it had proven itself to be undersized to comfortably fit modern fire apparatus, provide areas to train its firefighters, and house a facility to keep them fit. They tore down the old station in the fall of 2011 and built a new $2.1 million fire station in the spring of 2012 to overcome the deficiencies of its predecessor and serve the needs of the fire company long into the future. While most areas of the building were completely finished, the architect left the apparatus bays as exposed concrete floor surfaces to be addressed by Ingomar after the concrete fully cured. The bare concrete was susceptible to absorbing road dirt and grime, road salt, and leaking fluids from the vehicles, including hydraulic fluid, transmission fluid, brake fluid, and diesel fuel. This exposure degrades the concrete. The unfinished nature of the concrete also meant that it would absorb carcinogen-rich soot from equipment that was cleaned on the porous surface after it was used to fight fires, increasing the potential that the firefighters could come in direct contact with cancer-causing agents. The fire company administration knew they had to find a coating that would seal and protect the exposed concrete floor surfaces in the apparatus bays to help stop further decay and degradation. 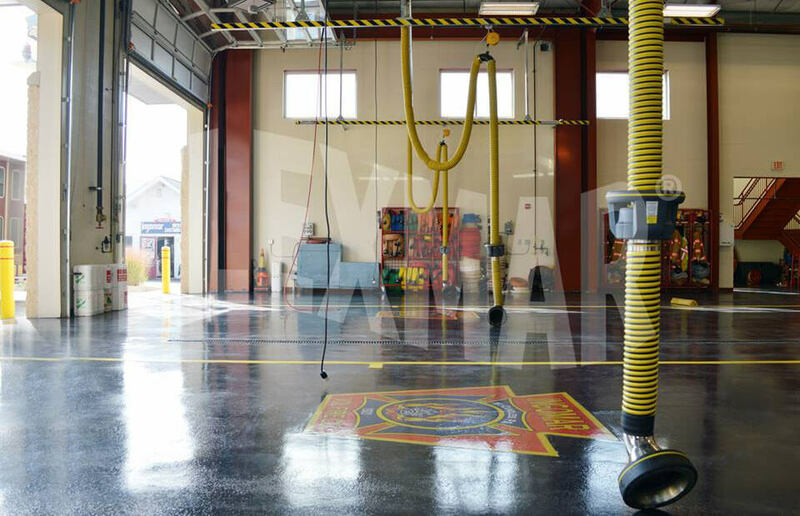 An epoxy coating covered the concrete floor surface of the previous fire station’s apparatus bays. While it provided some resistance from day-to-day dirt and grime, the epoxy coating system fell short in several aspects. First, the epoxy coating didn’t resist exposure to diesel fuel, hydraulic fluid, transmission fluid, and brake fluid. Despite attempts to chemically clean the floor to remove stains, damage resulted, and the fire company had to use absorbent pads underneath the vehicles to help prevent any future staining and degradation to the epoxy coating. Second, the epoxy coatings were highly susceptible to hot tire pickup from the fire trucks, which weigh in excess of twenty tons. As a result, the epoxy coating would quickly discolor, then bubble, then lift wherever the tires would come to rest in the bays, eventually leaving spots on the floor with bare concrete showing and absolutely no coating protection. Perhaps more importantly, the fire company could not place their apparatus bays out of service for days at a time while an epoxy coating system was applied and fully cured. The station had to remain operational twenty-four hours a day, seven days a week. So fire apparatus still had to remain at the station and firefighters still needed access to the building, their gear, and all of the equipment within the building. From experience at the previous station, Ingomar VFC knew that they needed a different type of concrete coatings system that would limit any disruption to the fire company’s operations during the application, and then hold up to the tough abuse that these floors face on a daily basis to provide long-lasting protection and good looks. A member of the board of directors had experience working with different concrete coatings technologies and recommended a polyaspartic coatings system for the floor. Polyaspartic coatings are up to four times more durable than epoxies. They are wear, scratch, and abrasion resistant. Polyaspartics resist staining and damage due to splash and spill exposure to a long list of chemicals, including Betadyne, acid solutions, automotive fluids, and even Skydrol. Plus, polyaspartic coatings won’t chalk, yellow, or fade due to age or exposure to the sun or UV lighting. It was clear that polyaspartics were right for the fire service. Choosing the right polyaspartic coatings manufacturer was simple, once the fire company’s board of directors learned about FLEXMAR Coatings. They were impressed by the industry expertize, product quality, and performance. Polyaspartic coatings technology was introduced to the industrial corrosion-protection coatings market in the early 1990s by Bayer MaterialScience. These coatings were ideal for use on bridges and rail cars, in tunnels, etc. In 2005, FLEXMAR Coatings was one of the first companies to use Bayer MaterialScience raw materials to formulate the highest quality polyaspartics for retail, commercial, and residential concrete floor coatings. 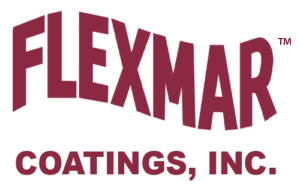 And in 2007, FLEXMAR Coatings was named a “Best Decorative Product” by Concrete Construction magazine. Since then, FLEXMAR Coatings has led the polyaspartic concrete coatings industry by continually improving polyaspartic coatings technology, something that other polyaspartic manufacturers and resellers are either unable to do or just haven’t done. FLEXMAR polyaspartics feature 0 VOCs, virtually no odor, and a longer working open time along with a one-hour rapid re-coat time and one- to two-hour return-to-service time. Plus, FLEXMAR polyaspartics are factory-pigmented, ensuring a higher density of pigment for superior hide and filling over concrete, and consistent batch-to-batch color. using an iridescent additive to increase the depth of the look, and an aggressive slip reduction agent to enhance safety on the surface when wet. The process began with surface preparation. The application crew diamond ground the concrete to remove any contaminants that had been absorbed into the concrete, and to create the optimal surface profile to accept the polyaspartic coating system. Any hairline cracks were repaired as well. Next, a solid-color base coat of White Night Grey FLEXMAR Self-Prime H.S. polyaspartic coating was tightly rolled on the floor surface to seal the concrete and provide an even, light-colored surface. This coat was dry in about an hour and ready for the next coat. Then, they hand-applied a second coat, an initial coat of Storm Cloud Grey FLEXMAR Variegate polyaspartic stain-sealer. The applicators worked to achieve random strokes with even shading. This coat was dry in about an hour and ready for the next coat. The third coat, a second coat of Variegate stain-sealer, was hand-applied the same way, darkening the color, adding more depth to the look, and muting individual strokes. An aggressive slip reduction agent was broadcast into this coat while it was still wet. Like the first two coats, this coat was dry in about an hour and ready for the next coat. The finish coat was a proprietary mixture of Variegate stain-sealer, FLEXMAR Clear Coat H.S. polyaspartic sealer, and the iridescent additive. It was hand-applied like the previous two coats, and more of the slip reduction agent was broadcast into this coat for additional protection against slips and falls. This coat was ready to be walked on in about an hour and could withstand light traffic later in the evening. during the application process. The amount of equipment that had to be moved in preparation for the floor work was kept to a minimum, and the firefighters could keep their focus on their normal day-to-day tasks. Because FLEXMAR polyaspartic coatings dry within an hour or two, the fire trucks were able to be returned to their spots in the bays in the evening. Bays weren’t placed out of service for days at a time. The fire company didn’t have to worry about finding alternative places to park the equipment during a lengthy application and cure process. And they weren’t concerned about overnight theft from or damage to the apparatus since they could be secured inside the station every evening, as usual. Finishing the appearance of the apparatus bay floor are two large, sixty-inch-wide fire company logos, embedded within a layer of FLEXMAR Clear Coat H.S. polyaspartic sealer. They are located in between each bay, right where firefighters enter and exit the trucks. For the fire company, it’s a matter of pride. The true test of endurance and durability began once the rigs were pulled back into the freshly coated bays, and hasn’t stopped since. So far, the FLEXMAR polyaspartic floor system has received rave reviews. The firefighters report that caustic fluids that leak on the floor are simply cleaned with a mild detergent and water with no visible damage to the coatings system due to exposure to these chemicals. Hot tires from the twenty-ton vehicles leave no marks on the coating. It’s provided both the remarkable appearance the fire company can be proud of and the durability that they can depend on.